These skis are expected to offer excellent value, but also strong performance at intermediate to advanced speeds on groomed slopes. 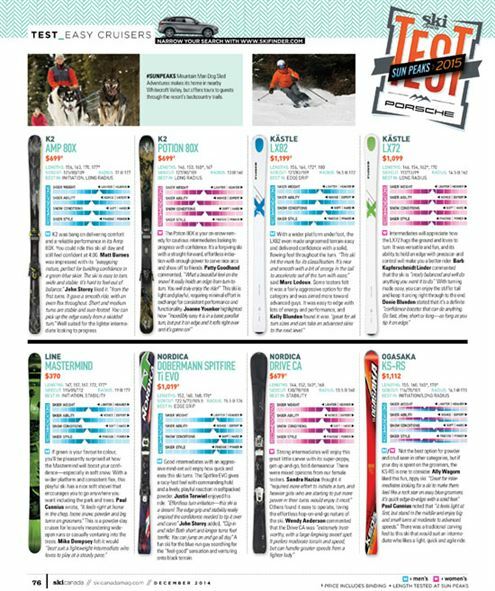 Appropriate criteria such as ease of initiation and stability were given a lot of attention in identifying the best skis in this category. Easy Cruisers represent, for many skiers, their ﬁrst carving skis and skis that can grow with them as speed and skills increase. Waist 70-75 mm. 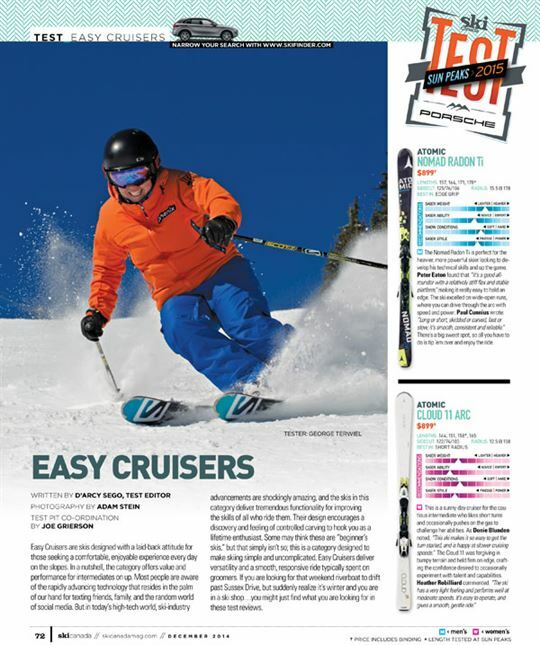 Mind the Gap: While reading the Easy Cruisers Test, note the price difference between skis, as much as $830. 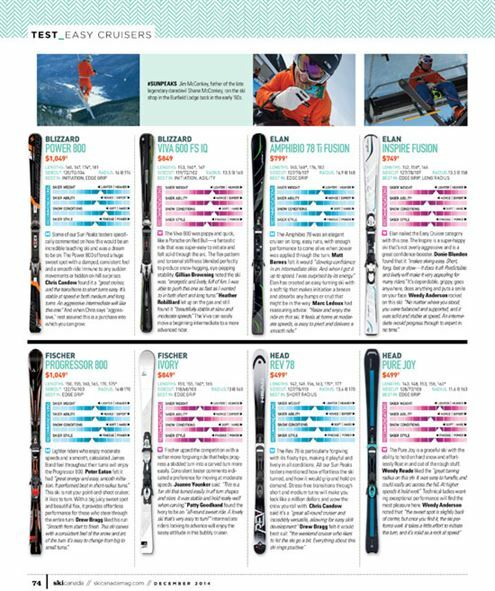 Models submitted by manufacturers for this category range from progressing to more of a high-performance ski. MEN: The Nomad Radon Ti is perfect for the heavier, more powerful skier looking to develop his technical skills and up the game. Peter Eaton found that “it’s a good all-rounder with a relatively stiff flex and stable platform,” making it really easy to hold an edge. The ski excelled on wide-open runs, where you can drive through the arc with speed and power. Paul Cunnius wrote: “Long or short, skidded or carved, fast or slow, it’s smooth, consistent and reliable.” There’s a big sweet spot, so all you have to do is tip ’em over and enjoy the ride. MEN: Some of our Sun Peaks testers specifically commented on how this would be an incredible teaching ski and was a dream to be on. The Power 800 offered a huge sweet spot with a damped, consistent feel and a smooth ride immune to any sudden movements or hidden on-hill surprises. Chris Candow found it a “great cruiser, and the transitions to short turns easy. It’s stable at speed in both medium and long turns. An aggressive intermediate will like this one.” And when Chris says “aggressive,” rest assured this is a purchase into which you can grow. WOMEN: The Viva 600 was poppy and quick, like a Porsche on Red Bull—a fantastic ride that was super-easy to initiate and felt solid through the arc. The flex pattern and torsional stiffness blended perfectly to produce snow-hugging, eye-popping stability. Gillian Browning noted the ski was “energetic and lively, full of fun. I was able to push this one as fast as I wanted to in both short and long turns.” Heather Robilliard let up on the gas and still found it “beautifully stable at slow and moderate speeds.” The Viva can easily move a beginning intermediate to a more advanced rider. WOMEN: Fischer upped the competition with a softer more forgiving ride that helps progress a skidded turn into a carved turn more easily. Consistent tester comments indicated a preference for moving at moderate speeds. Joanne Younker said: “This is a fun ski that turned easily in all turn shapes and sizes. It was stable and held really well when carving.” Patty Goodhand found the Ivory to be an “all-round sweet ride. A lovely ski that’s very easy to turn!” Intermediate riders looking to advance will enjoy the sassy attitude in this bubbly cruiser. MEN: K2 was bang on delivering comfort and a reliable performance in its Amp 80X. You could ride this ski all day and still feel confident at 4:00. Matt Barnes was impressed with its “easygoing nature, perfect for building confidence in a green-blue skier. The ski is easy to turn, wide and stable. It’s hard to feel out of balance.” John Storey liked it “from the first turns. It gave a smooth ride, with an even flex throughout. Short and medium turns are stable and sure-footed. You can pick up the edge easily from a skidded turn.” Well suited for the lighter intermediate looking to progress. MEN: Good intermediates with an aggressive mind-set will enjoy how quick and easy this ski turns. The Spitfire EVO gives a racy-fast feel with commanding hold and a lively, playful reaction in softpacked powder. Justin Terwiel enjoyed his ride: “Effortless turn initiation—this ski is a dream! The edge grip and stability really inspired the confidence needed to tip it over and carve.” John Storey added, “Clip in and ride! Both short and longer turns feel terrific. You can jump on and go all day.” A fun ski for the blue-run guy searching for the “feel-good” sensation and venturing onto black terrain. MEN & WOMEN: Not the best option for powder and crud seen in other categories, but if your day is spent on the groomers, the KS-RS is one to consider. Ally Wagorn liked this fun, zippy ski: “Great for intermediates looking for a ski to make them feel like a rock star on easy blue groomers. It’s quick edge-to-edge with a solid feel.” Paul Cunnius noted that “it feels light at first, but stand in the middle and enjoy big and small turns at moderate to advanced speeds.” There was a traditional carving feel to this ski that would suit an intermediate who likes a light, quick and agile ride. WOMEN: Freedom in each new turn, a beautiful ride…most intermediates can’t go wrong with the W-24. This ski is easy to turn with its abundant edge grip. Gillian Browning thought it “a super choice for carving up the groomers. Just step in and go.” With a nice soft flex you can relax knowing you’re in the hands of a good friend—a trustworthy characteristic you grow to love. Heather Robilliard emphasized how “awesome, stable and precise it was. From start to finish, I enjoyed the outing.” It’s best suited for the intermediate skier looking to improve and carve the groomed runs. MEN: An intermediate searching for reliability and a little extra encouragement to hop up his pace and rip a bit will enjoy the RTM 80. John Storey commented that it “has a solid feel with a stiffer flex that suits heavier guys wanting a stable feel for bigger cruisy turns.” With great edge grip, the ski excels on hardpack and really likes to carve, but not if you sit in the backseat. Kelly Blunden found that “it likes pressure on the front to drive into the turn.” Driving from the front of the boot puts you up on the sweet spot, providing a nice racy feel. WOMEN: The softer tip of the Chiara provides forgiving turn initiation with amazing edge grip to ensure steep-terrain stability. It’s well suited to strong intermediates looking to challenge themselves and attack new terrain. Wendy Reade noted, “This ski loves the fall line. With such a stable platform underfoot and throughout the arc, it holds very well at speed, with ample versatility and quickness for shorter turns.” Ally Wagorn added, “Once initiated, it rockets across the fall line. Don’t worry if you venture to the ungroomed—this one holds its own. It’s powerful, stable and great fun.” Definitely a Miss Congeniality candidate!